With all the hoopla over Madison Bumgarner’s World Series exploits, and that hoopla is well deserved, it’s time to put it into a bit of perspective. Somebody called it the greatest World Series pitching performance ever. Well, it isn’t. For one game nothing can top Don Larsen’s perfect game in 1956. Not only was it a perfect game but it came against four future Hall of Famers: PeeWee Reese, Duke Snider, Jackie Robinson, and Roy Campanella. Not bad, right? OK, so it’s not the greatest one game performance ever, it’s still gotta be the best ever for a single series, right? Well, no. Let me take you back to 1905. The 1905 World Series, the second played, pitted the New York Giants (Bumgarner’s team removed one coast) and the Philadelphia Athletics (now playing across the bay from Bumgarner’s team). Connie Mack’s A’s were a pitching heavy team that was pretty typical for the era. The Giants, led by John McGraw, were likewise pitching heavy. 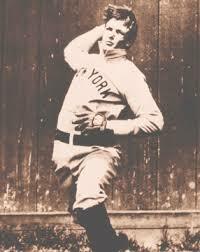 And the heaviest pitcher on either side was Christy Mathewson. Mathewson was 24 and coming off a season that saw him with (read these numbers carefully) 31 wins, nine losses, a league leading 1.28 ERA, a league leading 206 strikeouts, and only 64 walks given up. His ERA+ was a career high 230 and his WHIP was a miniscule 0.933 (and it would get better a few years later). His Baseball Reference.com version of WAR was 9.1 (tying for his fourth best WAR). Mathewson started game one against fellow Hall of Famer Eddie Plank. Plank pitched well, giving up three runs (all earned), walking two, and giving up 10 hits. Mathewson was better. He pitched a complete game shutout giving up four hits and walking none (to go with six strikeouts). He gave up a single in the fourth, a double in the sixth, and doubles in both the eighth and ninth. Only one man, the first double, got to third. Well, the A’s won game two, so McGraw decided to start Mathewson again in game three on two day’s rest. The short rest really got to him. He still didn’t give up a run in a complete game shutout, and again he only allowed four hits, but he did walk a batter finally (it went to Socks Seybold in the second inning). He did compensate by striking out eight. The walk was Mathewson’s first charged baserunner of the game (there’d been an error in the first), but he was erased on a force out at second. He allowed a single in the fifth. Then got into some trouble in the seventh when he allowed two singles. The first runner was erased on a double play and the second died at first when the next batter grounded to first unassisted. He hit a man in the eighth (see, I told you the two day’s rest was a problem) but got the next batter. With two outs in the ninth he allowed one more single, but struck out the next batter to end the game. The Giants won game four and McGraw decided to end the Series as quickly as possible. With one day’s rest, he sent Mathewson back to the mound. It wasn’t unheard of to do it in the Deadball Era, but it wasn’t exactly common either. Mathewson responded with another great game. This time he again went nine innings without giving up a run. He did have one down stat though. He gave up five hits instead of four. And only struck out four while walking none. He gave up a leadoff single, but no runner advanced beyond first. There were two singles in the second, but a double play and caught stealing ended the inning. In the fifth he gave up a double with two outs and got out of it. In the sixth it was a harmless single that produced the final hit. The Giants won the World Series in five games. Mathewson’s line reads as follows: three wins, no losses, an ERA of 0.00 over 27 innings (three complete games). He gave up 13 hits, walked one, and struck out 18. His WHIP was 0.519 and exactly one runner (in game one) got to third base. Interestingly enough, eight different Athletics managed a hit off Mathewson. Harry Davis and Topsy Hartsel each got three and Seybold picked up two plus the only walk. The game was different in 1905. It wasn’t integrated, there were only day games, pitchers pitched more often, the home run was not a major offensive weapon, and there were less playoff rounds. Be all that as it may, it’s still the greatest World Series pitching performance ever over a complete Series. This entry was posted on October 31, 2014 at 9:49 am and is filed under Baseball. You can follow any responses to this entry through the RSS 2.0 feed. You can leave a response, or trackback from your own site.